American fashion A�brand, Forever 21, opened two more stores in the city, at Orion Mall and VR Mall, last week. Bollywood stars Ileana Da��Cruz, and Aditya Roy Kapur launched the new stores, which saw a huge turnout. The launch was followed by an afterparty at The Ritz-Carlton that went on into the small hours. DJ Blake entertained the crowd with some a��90s soft rock, as they chatted over finger food,and premium wines. 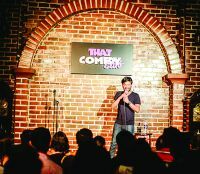 South Indiaa��s first comedy club, That Comedy Club, opened its doors in Church Street over the weekend. It is the latest venture of Sumendra Singh, and Adeel KQ. The launch event was marked by a string of acts by artistes, such as Jeeveshu Ahluwalia (from Delhi), Daniel Fernandes (from Mumbai), and the citya��s very own, Sundeep Rao. Dev D music composer Amit Trivedi wowed A�audiences at this Whitefield tech park with an energetic, foot-tapping concert last week, held as part of the multi-city Red Bull Bus Tour. He was joined on stage, which was set atop a superbus, by singers Neeti Mohan, Divya Kumar, and Arun Kumar. Together, they belted out some of Tivedia��s greatest hits, from O Pardesi, to Shaam Shaan-daar, and even broke into garba and bhangra.